Many women suffering from menopause desire to find a solution to their symptoms without the use of prescribed medication. That is why Gaia Herbs has produced a natural dietary supplement that not only helps with menopause, but also PMS. Its claims to support healthy transitions and promote a healthy emotional state will appeal to most women struggling with hormonal difficulties. Although some have deemed this product unsuccessful by actually increasing symptoms, a large majority of reviewers have found great success. For this reason, Women’s Balance deserves a closer look. According to Gaia Herbs, 1 capsule of Women’s Balance should be taken three times a day between meals. 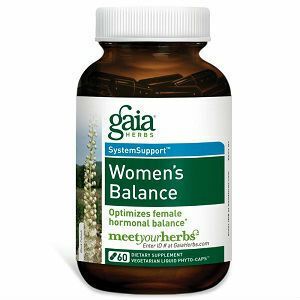 Women’s Balance can be purchased on Gaia Herbs’ website in two different packages. A customer can purchase 60 capsules (a 20 day supply) for $28.99 or a 3 bottle package (180 capsules= 60 days) for $82.17. Also, consumers can save 10% and receive a free gift by signing up for recurring delivery. While researching information concerning this particular product, it was discovered that Gaia Herbs provides a 100% satisfaction guarantee. If a customer is not satisfied, they can return their purchase for another item or a full refund. However, there is no indication as to how long this guarantee lasts. Although Women’s Balance does provide a natural hormonal balance supplement, a few inconveniences have arisen which should be taken into consideration. The first inconvenience concerns the vague benefits. While this product does promote healthy transitions and emotional states, it is uncertain as to how this supplement addresses specific menopause symptoms. From some reviews, it is clear that Women’s Balance does not eliminate all symptoms associated with menopause. The reason for this may derive from the fact that this supplement covers several elements and does not specifically focus on menopause. Therefore, if Women’s Balance cannot eliminate all menopause symptoms, additional supplements or medication must be sought. A second inconvenience concerns the guarantee. Although women can receive a full refund, it is unclear if this guarantee expires. In order for this guarantee to be valid, it would have to never expire considering women have not been provided with a timeframe in which they can expect to see results. Jackie Horowitz	reviewed Women's Balance By Gaia Herbs	on July 23rd	 and gave it a rating of 2.